When in doubt, The Simpsons did it first. One of the most overused expressions when describing a comedy is to say that it’s explosively funny. Most of the time, what that means is someone on screen is merely doing something out of character, which rarely makes sense in context with the rest of the story. It’s the laugh for the sake of a laugh, which is to say it’s a cheap laugh. Good comedy needs to be based, however tenuously, in reality. And so, here I go in saying something I’ve never said in a movie review (as far as I can remember): “21 Jump Street” is an explosively funny movie. The plot is admittedly formulaic, but it’s by design; there are beats that this movie simply has to hit, so the script wisely focuses its energy on the biting self-awareness that strings the beats together. As remakes of ‘80s properties go, you’d be hard pressed to find one so self-deprecating, yet ruthless. Schmidt (Jonah Hill) and Jenko (Channing Tatum) were not friends in high school. Schmidt was unpopular but smart, while Jenko was popular and, well, not smart. The two form an unlikely alliance years later as police academy cadets, helping each other in the areas where they are lacking. After their first arrest on the job results in the suspect walking on a technicality, Schmidt and Jenko are assigned to go undercover at a high school and figure out who’s supplying the kids with a new and potentially deadly drug. Neither wants to relive high school, but Jenko inadvertently ups the awkwardness factor when he forgets his fake name, and the two are forced to assume each other’s identities, rather than the ones that they were assigned. Jonah Hill is going to get the press because he co-wrote the story with screenwriter Michael Bacall, but Channing Tatum is the one who makes a star turn here. After starring in forgettable historical dramas like “The Eagle” and mushy romances like “Dear John,” Tatum displays a deft sense of comic timing that was only previously hinted at in the otherwise terrible “The Dilemma.” Why Tatum would wait so long to show the world his true talent is a mystery, though to be fair, beefcake is a profitable business. How curious that “21 Jump Street” is directed by Phil Lord and Chris Miller, which makes it the third movie in three months to be directed by an animation veteran making his live action debut. Lord and Miller’s previous movie was the gem “Cloudy with a Chance of Meatballs,” which explains the manic energy and occasional flashes of animation here. The two shoot the movie like pros, and while it’s tempting to hold the faults of the final action sequence against them (the bad guys, surprise, are terrible shots), that is really just another knowing wink at the source material. They could have done a better job of directing Ice Cube, though. He has so many great lines, and he delivers them all like he’s Samuel L. Jackson in “Deep Blue Sea,” seconds before the shark gets him. Last year’s remake of “Footloose” proved that the idea of rebooting a much-loved but dusty property isn’t really as vulgar as it often seems. 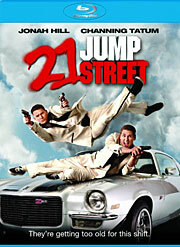 With a few more movies like “21 Jump Street,” we might actually reach the point where the news of another title receiving a makeover will be met with open arms. That concept would have sounded completely foreign a few years ago, but then again, the studios were doing these movies horribly wrong a few years ago. Here’s to raising the bar. Every little counts. This originally ran May 12, 2012 on Bullz-Eye.com. Powered by Parabola & WordPress.